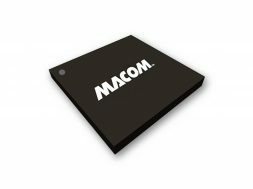 The MASW-011036 is a high power SPDT with 50 ohm terminated RF ports. This broadband (26 to 40 GHz), high linearity, SPDT switch was developed for Ka-band applications that require up to 13W of power handling while maintaining low insertion loss and high isolation. The SPDT MMIC utilizes the company’s proven AlGaAs PIN diode technology. The switch is fully passivated with silicon nitride and has an added polymer layer for scratch protection. Its protective coating prevents damage to the junction and the anode airbridge during handling and assembly. The die has backside metallization to facilitate an epoxy die attach process. It includes DC blocks and RF bias networks. Applications include aerospace and defense.